The One Spirit Alliance works to promote and provide a forum for spiritually-minded people, organisations and networks to foster connection and collaboration between them. The One Spirit Alliance is founded on a recognition of the One Spirit that underpins all life. This One Spirit inspires a shared consciousness that takes us beyond all established boundaries. It is underpinned by values and principles that ignite our love for each other and foster care and appreciation of our planetary home and its place in the cosmos. This awareness has grown out of meditation, individual and collective spiritual experience and new approaches to science which have lead to a realisation of the greater whole. The vision of One Spirit Alliance is to facilitate the coming together of the diverse spiritual paths which draw on a variety of faith, ethical and ecological traditions as well as new explorations. By engaging in conscious conversations and shared silence we can discover the unity that lies at the heart of all paths that seek a harmonious way of life. We believe in the principle of one global family. For more on the background of OSA, click on <About OSA>. 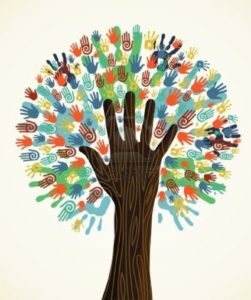 Report on “We are all One” CANA November 2018 conference. DVDs available! Hawkwood College Celebrates its 70th Anniversary! Sometimes one wonders where customs around religious festivals originate ~ is there more to it than just something in that religion? Take the Easter egg hunt – perhaps you are having one yourselves this Easter! What is that? Why an egg? A reflection: the egg hunt has a deeper level to it, that goes beyond a religious tradition. What is the egg? It is a very real bringer of new life. From this, it has been a symbol down the ages for creation, or birth, or new-birth. In Ancient Indian mythology, out of a shining golden egg arose heaven and earth. The Persians pictured the world before evil as a huge light-egg. In one Egyptian myth, the first god arose from an egg. In Greek myths of creation, the great Goddess Nyx laid a silver egg, from which came a god with golden wings: Eros, the god of love. In Christian symbolism, the egg is a symbol for the resurrection: new life from an inner golden sun breaks through the hard outer shell, overcoming the confines of the hardened mineral world. Which goes to remind us: We need to think a little out of the box when it comes to religious customs and festivals – many have deeper meanings that transcend borders of faiths, relating to the spirit that weaves and works in all. A selection of events which may be of interest to you! Click on the title (if underlined) for more information, otherwise see our Places, People & Events page for more information about the centres, sample events and contact details. Be part of our front page! Do you have a story or an experience you would like to share? Or something creative – a poem, an art work, a photo? Send it to us at One Spirit Alliance (click here for sending us an email), and if there’s space in this space, it can add to the welcome for people visiting the website. And if we have too many for the moment, we could put it in our next One Spirit Alliance newsletter (we’ll let you know before doing that). We look forward to hearing! The aim is to show a sampling of the wide variety of creative intiatives, organisations and events which have a base in a spiritual and holistic orientation towards life. Really, it’s quite amazing! For any member of the public looking for something in this direction, it can be a help and guidance. For the sceptical materialists, it is evidence of a different widespread spiritual orientation – that is rapidly gaining ground! – You can follow us on Facebook! Click here. Inspirations, initiatives, anecdotes and events – all in one compact quarterly newsletter, and the occasional mailing about a special event or project. Not to overwhelm the inbox but to inspire the inner self and help you connect with others. You can cancel at any time. The Albion Project Website had its launch April 2018 at Chalice Well, Glastonbury, a legacy project of the Wrekin Trust. This site explores the essential ideas contained in British spirituality. It acknowledges the central role played by key forerunners and the emergence of many positive forward thinking organisations. You will find links to these projects plus a wonderful directory of forty one sacred sites from Callanish in the north of Scotland to St Michael’s Mount in Cornwall. You’ll discover stories of legends, myths and histories that combine to illuminate our understanding of the ancient name for Britain, Albion, for when Albion awakes the long sleep will be over. It provides a window into an amazing unfoldment of spiritual wisdom with many links to publications, books, maps and further information. Click here to visit the new Albion website. Contact them if you would wish to be listed amongst initiatives taking place in the UK. This book, first published in 2017 in hardback edition, is now out in softback! 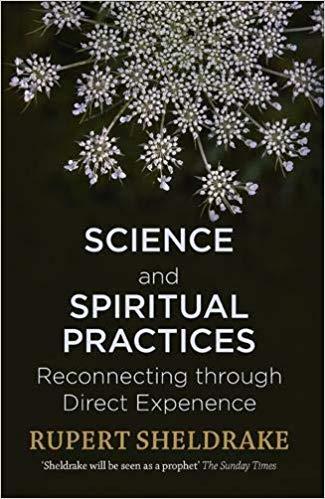 Well known for his book, The Science Delusion, Sheldrake takes the topic further in this new book, Science and Spiritual Practices, exploring how spiritual practices are now being investigated scientifically by many. 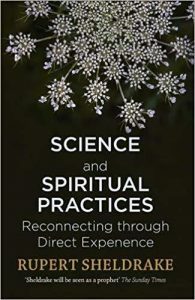 Rupert Sheldrake summarizes the latest scientific research on what happens when we take part in spiritual practices, and suggests ways that readers can explore these fields for themselves. For those who are religious, Science and Spiritual Practices will illuminate the evolutionary origins of their own traditions and give a new appreciation of their power. For the non-religious, this book will show how the core practices of spirituality are accessible to all, even if they do not subscribe to a religious belief system. Some 10 years ago, Bruce Lipton came out with his groundbreaking book, The Biology of Belief. As with Rupert Sheldrake’s books (see above) or Eben Alexander’s book, Proof of Heaven, it especially shook scientists, as here were scientists themselves, not just some spiritually minded mystics, challenging materialistic views of the prevailing science of today and showing how we can apply scientific thoughts and methods to spiritual matters. New clips keep appearing of Bruce Lipton on the themes of his book, delightful and provocative on various themes. This clipping here appeared on YouTube recently. Enjoy! 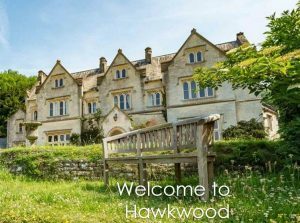 Hawkwood College celebrates 70 years! At 9.00 pm every night, join a community across the world making its attunement with the heart of light. Follow your own practice – a prayer, holding an image of light, speaking a formula, lighting a candle – but above all link with spirit and with all who share in this attunement. For further information, go to https://www.heartoflight.org/.